Please note that this only is a temporary solution that was only released due to the high demand. It will be replaced with a better solution once BootMii is available. Just download dvdx34.zip and extract it to your SD card. You should then be able to launch the installer from the Homebrew Channel. patchmii installation method had to be removed. 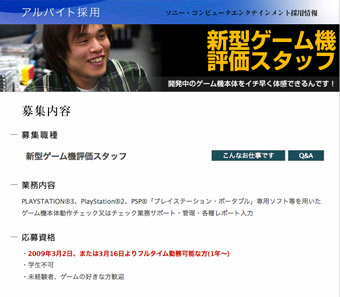 This very public job listing might get more fuel to those very persistent PSP2 rumors. Though, it also might simply be more a continuation of the current PSP and PS3 hardware iterations: slimmer with more memory. >From the checker statistics, were seeing about 10% of Wiis with the new boot1 (all newer ones). What will happen to those new Wiis that have it? At first, BootMii will not be compatible with those Wiis. A modified boot2 will not run on them, period. However, there is a way of accomplishing some of BootMiis goals on those Wiis, by installing BootMii as the System Menus IOS, or as an entirely separate IOS, for example. There are pros and cons to these options, and theyre not as good as installing BootMii as boot2, but they are possibilities worth exploring. We wont support them when BootMii first comes out (lest we delay it even further), but one or more of them might come in the future. Note that the metrics on the table are mostly relative to one another. Low doesnt mean crap, it means lower than Medium or High.